196 countries. A world of flavors. Ćevapi (or ćevapčići ) is a traditional recipe from the Balkans. 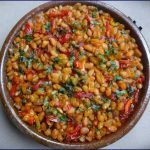 The actual dish typically consists of bread (lepinja), a condiment made ​​from red bell peppers (ajvar) and kebabs known as cevapi. The region of the Balkans has undergone significant geopolitical changes in recent decades. This is the reason why it is difficult to give an exact origin for the recipes from the region. Ćevapi (pronounced “tche-va-pee”) or ćevapčići (“tche-va-pee-chee”) is a kind of kebab that is quite common in the Balkan cuisine but also more generally in all of Southern Europe. These long meatballs are generally eaten in lepinja bread, and served with ajvar, but also chopped onions or kaymak (kind of cream). 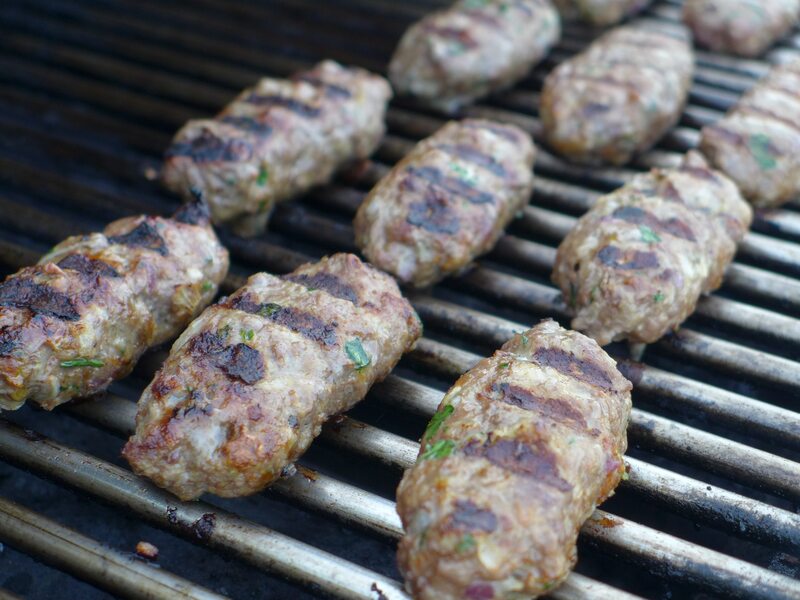 There are several different cevapi recipes, starting with the meat that is used, either pork, beef, or lamb, or combinations of these meats. I personally chose a more common version with lamb and beef. I would recommend using a little more lamb than beef, especially if you enjoy the stronger lamb flavor. We have attributed cevapi to Slovenia but we could also have attributed it to Serbia, Bosnia, Croatia, Montenegro, Macedonia, Bulgaria, Romania, Czech Republic, Slovakia, Austria or even parts of Italy… only we had traveled through all these countries already, or close to it! 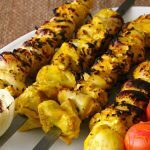 Cevap comes from the Persian word kebab. 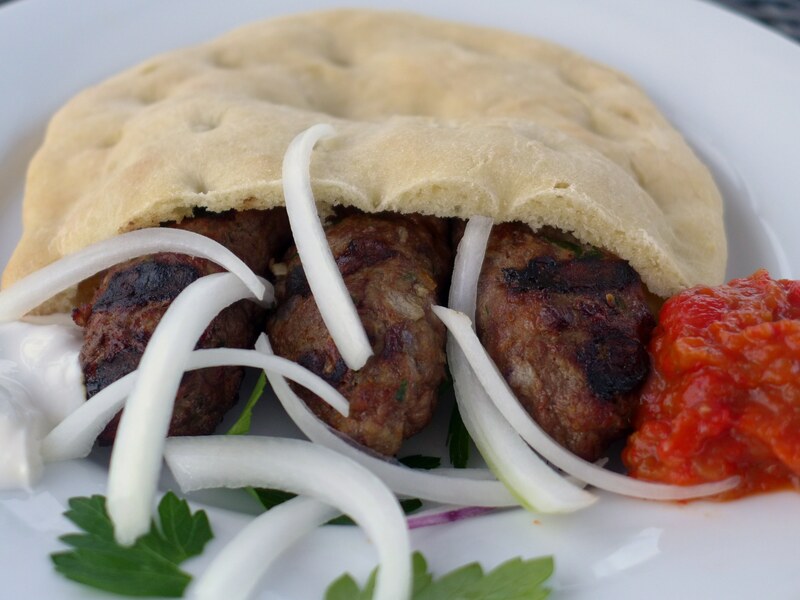 It becomes Cevapi in the plural form because it’s so good and you can not settle for just one! There are several versions of cevapi throughout the Balkans. This specialty was introduced by the Ottomans during their expansion in this region in the late Middle Ages. 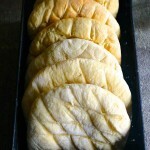 Leskovački cevap for example is a variant based on pljeskavica, a large hamburger from Serbia. In Bosnia, they bear the sweet name of travnički. 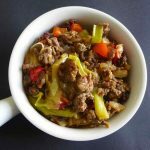 Baking soda in ground meat? Whača doin? This was the first time I used baking soda in ground meat and I think I will always do it from now on. 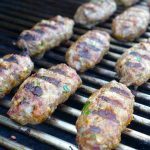 When I found a few cevapi recipes including this ingredient, I did some research and learned that it helped tenderize the meat and made it a little more airy. I tested it and I can now attest. The meat was much less dense and was lighter than usual. The lepinja was excellent. The dough is slightly more liquid than a traditional dough and the fact that it needs to rise three times gives the bread a light and airy touch. It was the second time I made ajvar. I had already prepared this condiment at the dinner with my Serbian buddy Djordje when I cooked my sarmas. 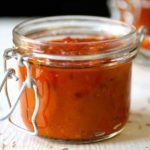 Ajvar is fairly simple to make and it is just delicious, especially with cevapi. Everyone loved it this cevapi dish, so much so that we ate it all weekend. I have to say that I bought 4 pounds of meat that I ground myself. I bought a grinder accessory for my KitchenAid 3 months ago and I cannot even fathom why anyone would buy pre-ground meat anymore! Ćevapi is a kebab that is common in Balkan cuisine. 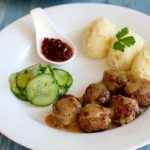 These long meatballs are generally eaten in lepinja bread, onion and ajvar. Make small kebabs of ground meat, about 3 to 4 inches long. Preheat barbecue (ideally) or a grill. Cook cevapi for 8 minutes on one side then turn over and cook for another 6 to 8 minutes. 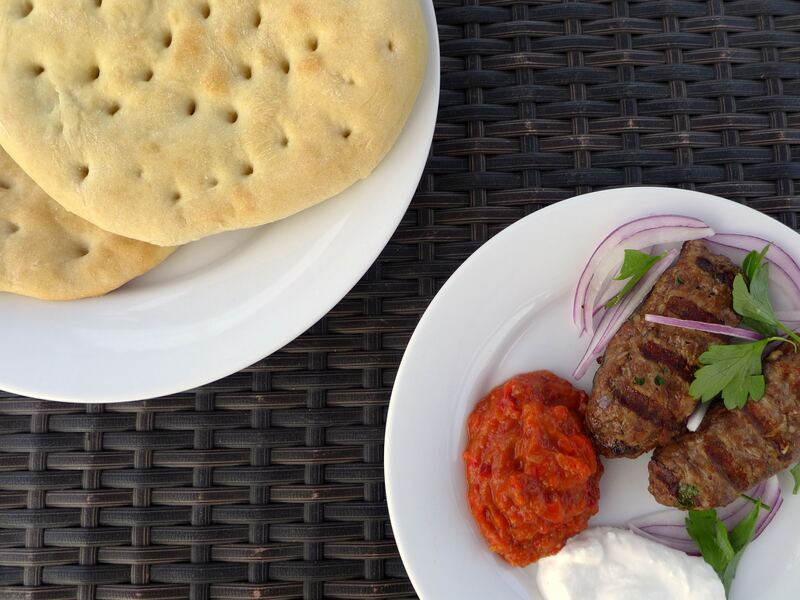 Serve 5 to 8 cevapi in the lepinja with ajvar, thinly sliced onions and sour cream. Mike is “the devil” of the 196 flavors' duo. Nicknamed as such by his friends, he is constantly in search of unusual recipes and techniques with impossible to find ingredients. The devil is always pushing the envelope, whether it is with humor or culinary surprises. Now, this said, your blog is fantastic! I’ll definitely be coming by again. Great recipe! I make these quite often and serve them in pocket pitas with tzatziki sauce, like a gyros. Good cold the next day too. The baking soda is the key ingredient. It really gives them an amazing texture. Also, I let them sit in the fridge for a few hours so the flavors meld. Thanks 196flavors for all of your wonderful ethnic recipes. It’s quite a learning experience, like traveling the world. I’m having fun in my old age trying your recipes.